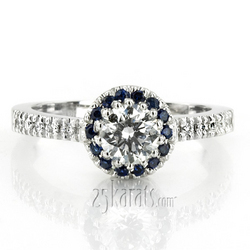 This classic halo engagement ring is furnished with sapphires and diamonds. 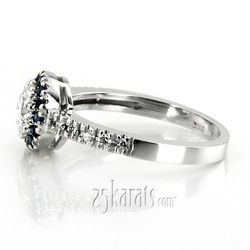 Shank is bead set with diamonds to add to the sparkle of the center halo. Engagement ring is set with 16-1.3mm sapphires with 0.16ct. tw., and 10-1.3mm diamonds with 0.10ct. tw. Available in 14k, 18k gold, platinum and palladium.